We read the story of Tiddalik about a frog that drank up all the water in the world. This story is a Aboriginal legend from Australia that explains how droughts happen. We wrote some stories about Tiddalik the giant frog and then we painted some pictures of him. 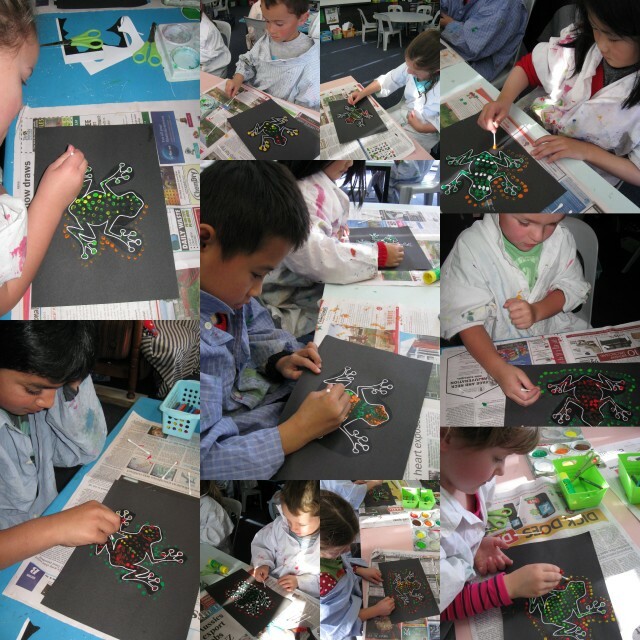 First we looked at some dot paintings from Australia and then we made our own dot paintings using cotton buds. Here are some photos of us painting our amazing pictures of Tiddalik and some of our finished stories. Hi I think your dot patterns are beautiful. They look great on the black paper. WOW!!!! They are so cool!!!! I love them!!! Keep up the great work!! !